It was time for a little dessert. Little did I know that “little” would be the operative word. Yes, I am on a diet. I was craving some ice cream and wanted to put the ice cream in a cone. I knew we had cones because the box of cones was on the dining room table the other night when I came home from work. I took the box out of the cabinet and opened it up. Something was strange. Very strange. There were way too many cones in the box. I removed one of the packages and it was as if I had hit the cone jackpot, there were so many of them. About one second transpired before I realized something was very wrong. The End of Days did not occur yesterday. Thank God (since the End of Days did not occur, does that mean there is no God? I digress). Instead, for a split second I thought I had been instantaneously transported to the world of the Lilliputians from “Gulliver’s Travels.” Because all of sudden, I was a giant, surrounded by cones the size of my thumb. Literally. I started to exclaim “What the f**k!” but caught myself because we were talking about a child-friendly subject and I didn’t want to offend my kids (as if). I started to laugh, my husband saw why I was laughing and he started to laugh too, and then the girls joined in. I know a lot of emphasis has been put on childhood obesity, but cones the size of a thumb aren’t really going to make a dent in the problem. They’re so impractical, they’re not even cute. 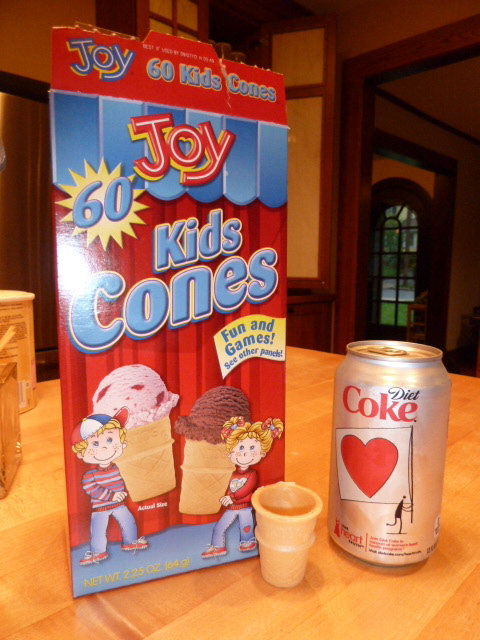 Sixty cones in the box, five calories apiece.